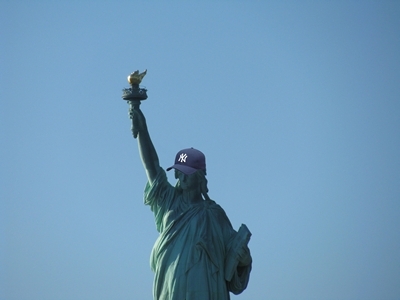 The New York Yankees continued purchasing the world today by picking up a right-handed flame throwing reliever, Statue O’Liberte’. Despite hailing from nearby New Jersey, the statue was signed to a fifteen year contract. The Yankees still face several daunting hurdles, however. A French glove maker was immediately commissioned to start working on the mitt for the new reliever. Construction is estimated to take a few years longer than the, yet to be started, downtown Freedom Tower. Also, the toll set by the Mafia-run Port Authority to transport the statue to-and-from each ball game may top Obama’s upcoming stimulus package.